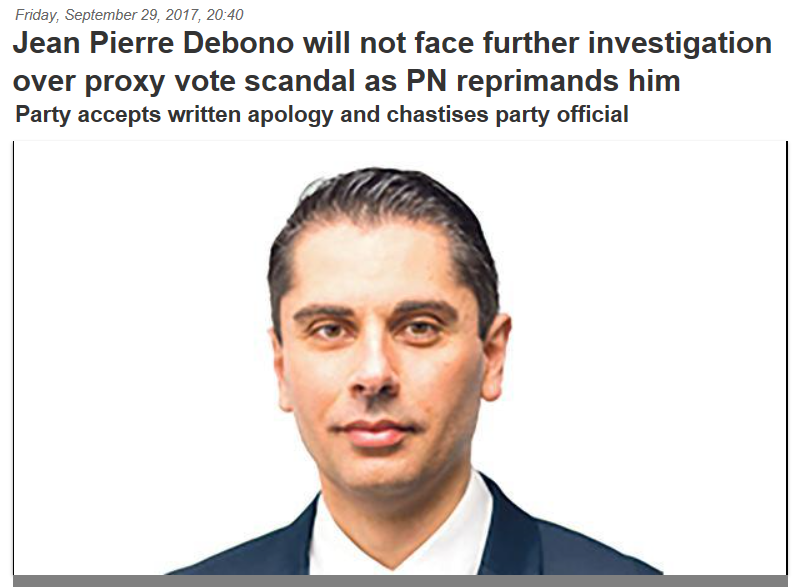 Just as I thought: Jean Pierre Debono was stitched up by his own co-conspirators, who – when their attempts failed at bullying, bribing or blackmailing other MPs into giving up their seat for Delia, leaked the confidential Nationalist Party electoral commission report which accused Debono of handling forged proxies to collect voting documents in the leadership election. Pinned to the wall by this scandal, he then gave up his seat after having sworn repeatedly that he never would, and in return the Nationalist Party has said it will not take disciplinary action against him, making do instead with his apology, his promise not to take part in any other electoral processes for a limited period and a “public warning”. Truly, there is no honour among thieves.